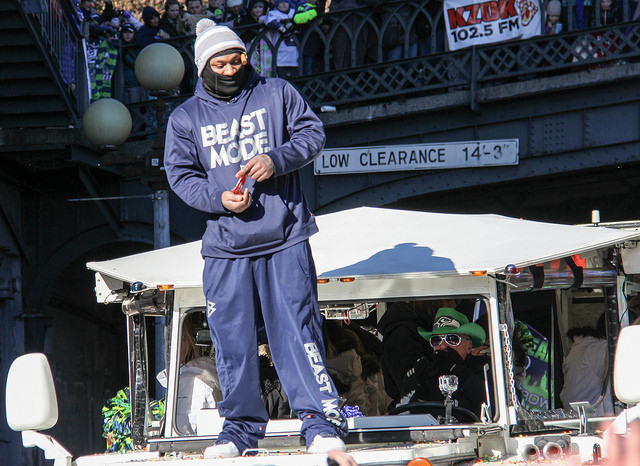 From reports of Christine Michael preparing to take over the backfield, to potential retirement plans, I was very down on running back Marshawn Lynch before the start of the 2014 NFL season. Then of course, Beast Mode was unleashed on the Green Bay Packers in Week 1. Before you slap yourself in the face for passing on Lynch, review some of the reasons why you passed on him. With the praise of Michael, reports were flying around that Lynch could lose 50 or more touches in 2014 from his 2013 total. That could have been a trick by the Seattle Seahawks, as either a motivation tool for Lynch or to fool opposing teams, but it certainly worked in scaring me. Either way, Michael is out with a hamstring injury, and the workload of 20 carries was far from light for Lynch last night. To go along with his potential loss of involvement in the offense, Lynch found himself in a contract dispute, accused of committing assault and property damage and appeared to be planning his retirement if the Seahawks did not pay up. You can see how the circumstances quickly seemed to point to a bust season for Mr. Beast Mode. What I failed to remember, however, is something Lynch said to describe himself: “Just bout that action boss”. It is so easy to get wrapped around all the drama outside of the game, and you can sometimes forget that nothing really matters until a player hits the field. Granted, some players and teams will find certain players or situations as distractions, and at the end of the day, these men can take their personal issues into work just like everyone else. Lynch, however, doesn’t care what people think about him, and he is only concerned with his performance on the football field. So boss, can he keep up the pace for the rest of the season? According to the good people of Fantasy Pros, Lynch has the seventh-easiest schedule for running backs in 2014. He isn’t going to see 21 touches every game, but the key to the Seattle offense is still Lynch, and it appears that he will receive plenty of opportunities. He still has 15 games to play, and anything can happen, but with Lynch’s 110 rushing yards and two touchdowns for the season opener, the 28-year old running back was most certainly about that action last night. I’m not surprised. I’m kinda shocked at his ADP leading into the final drafting weekend before this game. I saw some analysts placing him inside of the top ten, but not inside the top five. Maybe expectation and projections will change. Here is a crazy thing to think about. Just say we go off of last night, if almost 50% of the top-six running backs selected in drafts don’t finish as top-12 backs at the end of the year, and say Lynch does, that means at least three backs out of Lacy, Forte, Charles, McCoy, Peterson will not live up to their draft position. I would bet it would be Lacy, Charles and maybe Peterson if he gets injured, but Forte is getting up there in years. McCoy should still be a stud, but you never know.